'Twas the day Agent Kalorned became Professor Kalorned. 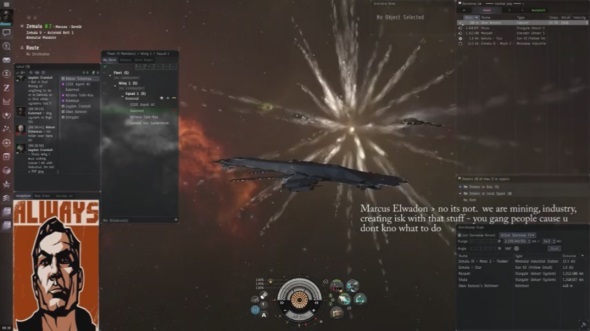 EVE University invited Kalorned to give a guest lecture on the subject of ganking, the New Order, and the Code. You can see his presentation materials here. Judging by the EVE University forum thread, Kalorned was a hit. There was unprecedented interest in this, the most fascinating and essential subject of highsec life. 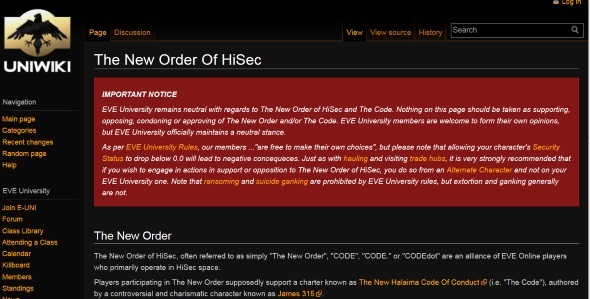 You might recall when a bitter EVE University director scrubbed their wiki page on the New Order. It's back up. They are officially neutral now. The Code is more and more a fact of life in highsec. We continue marching toward total cultural victory. Want to celebrate? Check out Kalorned's latest video. For me, Kalorned's videos are the tops. It's something about how he matches the music to what is essentially a gank-compilation. There's real magic in there. Thanks Kalorned! I was also pleased that his diplomacy managed to convince at least a few E-Uni folks of our essential reasonableness. Their considered and largely enthusiastic responses make such a change from the strident and hysterical outbursts to which we've all become so accustomed. Once again, thanks a million Kalorned. It is indeed nice to see E-Uni coming around. They were the target of some of our earliest focused campaigns due to their reputation of churning out carebears and risk-averse hisec dwellers. I congratulate them on giving reason and knowledge a chance to pierce the veil of preconceptions and misinformation that the Uni has previously been known for. "Note that ransoming and suicide ganking are prohibited by EVE University rules, but extortion and ganking generally are not." Lol.. I thought I was the only one who didn't quite understand that one. I'm guessing "non-suicide ganking" refers to killing an outnumbered enemy, which is usually called "blobbing"? I believe ganking is what they call it in most other games, and using universal terms seems logical for an article aimed at new players. As for extortion that isn't ransoming, could it mean something like threatening a wardec? I've grown so used to using the term 'ganking' to refer to suicide ganking. I think "Ganking" can be referred to basically "taking advantage of a target's unawareness to easily kill them." For example, instalock gatecamps can be considered "Ganking," but non-suicide at that. You could say that super capitals attempting to move stupidly that get bubbled and octuple doomsdayed get "ganked." And, of course the miners, who choose to fly ships in James 315 Space without permits, and that have no attack or defense, choose to be ganked. it's odd the term gank is short for gang kill so when one toon suicides another toon techinically that isn't a gank because he's not in a gang although we still use the term. So what you're saying is that all CODE. does is gank people, unless they're solo, and then the official term is "Elite Solo PvP," right? What about when someone is scared of undocking? For sure we cant count someone who does not undock as a code member? If you are not sure about what the requirements for Becoming an Agent of the New Order are, as clearly laid out by Supreme Protector James 315, either because you honestly don't know or because you are a carebear and are therefore too ignorant to know, the Requirements are clearly laid out in the Become an Agent tab at the top of this page. I will not click on it for you myself, because I do not wish to spoonfeed your wretched carebear entitlement any more than I already have. Obviously ming was to dumb to realize that Anon @ 3:16 was talking about it. Of course in ming's defense, alot of things go right over it's head. Look how angry you are. Go on, look at what you just posted. So there is a disgruntled miner at a bar at a local space station, sitting on a bar stool, staring at his drink for like a half hour. Ming Tso thinking he would be cool, goes up to the miner, grabs his drink and drinks the entire glass down in one shot. The miner starts crying, and ming says "look, im sorry, let me buy you another drink"
The miner says "Earlier today i was out mining and got ganked losing my ship. Then i got back at station and caught my wife with another man. Finally i come to the bar and try to work up the courage to drink this glass of poison, and here you come and take it away and drink it just as im about to." 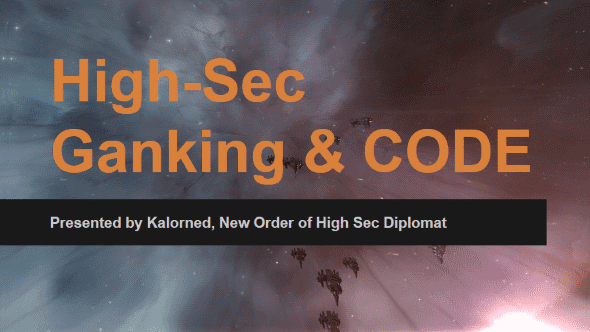 Highsec - the one and only destination for Elite PvP! Another Code Victory from a high sec hero Kalorned!!!!! Highsec is too dangerous, so I refuse to answer the door to my Captain's Quarters. Huzzah!! CODE. is mainstream EvE.